What is difference between maxima (or minima) and global maxima (or minima)? I am unable to understand meaning of global maxima (and minima). Are they the same as maxima and minima? We denote maxima or minima as either global or local. Simply writing maxima or minima is confusing and are taken to be the global ones by convention. A maximum or minimum is said to be local if it is the largest or smallest value of the function, respectively, within a given range. However, a maximum or minimum is said to be global if it is the largest or smallest value of the function, respectively, on the entire domain of a function. The image shows it clearly. You can check this video as well. Global (or Absolute) Maximum and Minimum. The maximum or minimum over the entire function is called an "Absolute" or "Global" maximum or minimum. 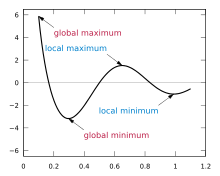 There is only one global maximum (and one global minimum) but there can be more than one local maximum or minimum. Terms "maxima" and "minima" are related to all types of maxima and minima, either local or global. Every local maximum is a maximum, every global minimum is a minimum. Not the answer you're looking for? Browse other questions tagged calculus terminology or ask your own question. Range of Local Maxima and Minima? Global Maxima and Minima of a function? How to distinguish between global maxima/minima and local maxima/minima of a function?